The PC-8001 mk2 replaced the PC-8001. In 1983, the PC-8001 still had great success in Japanese market. However, a lot of competitive PCs were released by other companies. PC-8001 had a tough race in business market because of poor graphics feature that cannot display KANJI characters. 3. Hardware/Software compatibility with the PC-8001. The PC-8001mkII was the answer. This machine was born with expectation and attention. The PC-hobby magazine publishers delayed printing to write detailed information of this machine. However, the expectaition of people changed to disappointment. Most competitive machine already had 640x200 8 color graphics but the PC-8001mkII only had black&white. A lot of hobby-users started to put money aside for the PC-8801 instead of purchasing the PC-8001mkII. This machine met a limited success, even though NEC had 40,000 back-orders. 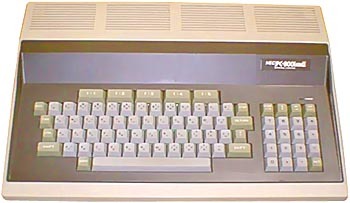 The PC-8001 was sold over 120,000 within 2 years. Thanks to Nomura Hisayuki for this information. see more NEC PC 8001 MK 2 Ebay auctions !